For a lot of MMO old-timers like myself, RuneScape was the first virtual world we ever dove into. I still have fond memories of getting in trouble in middle school computer class for setting out to become a Demonslayer, beating up dwarves for crafting materials, and wandering through crowded market squares filled with cries of “want to buy gf!” Some of you may be surprised to discover, though, that not only are our old stomping grounds still open to the public after all these years, they’re the best they’ve ever been. It’s still free, and better yet, you can revisit Gielinor in all its glory as a member at no cost for 30 days with a Twitch Prime membership. Across 17 years and over 200 patches, Runescape has completely transformed to the point that if “Hey Ya!” by Outkast was on the radio last time you played, you may not even recognize it today. Our little browser game has grown up into a shiny, detailed, modern MMO that even allows you to look up at the sky! Beyond the obvious graphical improvements, the map has been vastly expanded with huge, new areas to explore and countless new quests. 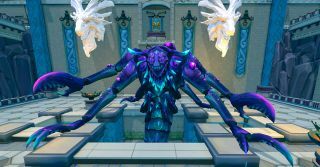 Just a few of the new skills that have come to RuneScape over the course of the last several years include Divination, which allows you to craft powerful signs and portents that trigger automatically to provide benefits to your character in moments of peril, and Invention, which lets you build various useful gadgets and machines that can do things like automate crafting tasks. Depending on how long you’ve been away, you might also be surprised to find you can now train in summoning familiars and even build your own house. Back in my day we’d have to squat in some random shack in Falador and yell at people who weren’t in our guild to get out. And remember that handful of great quests you’d always talk about around the lunch table? Slaying the demon for the first time? Slaying the dragon for the first time? Remember when they opened up Morytania? Well, if you thought any of that was epic, you’re going to have to recalibrate your epic-meter for some of the areas and quest series that have been added in the meantime. The quest designers have really made the most of the engine to create some genuinely clever, memorable, and ambitious adventures that will take you to the bottom of the sea, the depths of ancient ruins, and bring you face to face with the gods themselves. But possibly the best reason to come back to RuneScape is the enduring community of crafters, adventurers, monster hunters, merchants, and explorers who have been sharing this world for the better part of two decades. A cozy chat, some help with a quest, or the chance to team up and test your skills and those of your friends against a difficult boss are never far off. No matter how long you’ve been away, you’ll return to find that your favorite haunts are still flourishing with activity.